Jessica Cortell grew up on the Oregon coast prior to attending Oregon State University where she received a M.S degree in Horticulture and a Ph.D in Food Science and Technology. Currently, she manages her own consulting and vineyard management company Vitis Terra Vineyard Services and teaches at the Chemeketa Northwest Viticulture Center. Christine began her formal exploration of cheese in 1998 working the retail counter at the original Central Market in Austin, Texas. From there, she worked for Anco Fine Cheese as a trainer in Texas and with metro Portland-based DPI Northwest doing cheese marketing and education. In 2004, Christine created Cheese Chick LLC, a boutique cheese education and marketing company, through which she works with cheesemakers, retailers and consumers, to promote understanding of one of nature’s most intriguing foods. In 2005, she launched www.cheese-chick.com. The site features educational content, recipes and video, including the Meet Your Maker video segments showcasing Oregon artisans. Christine serves as President of the American Cheese Society, the cheese industry’s premier professional organization. A native of Bethlehem, Pa., Christine now savors cheese and life in Scottsdale, Ariz., with her husband, Matt and sons Aiden and Will. She’s a graduate of Dickinson College in Carlisle, Pa., with a degree in English. Andrea Johnson is a freelance photographer specializing in wine and travel. She has covered many of the world's wine regions, and her photographs are regularly featured in publications such as Wine Spectator, VIA, Sunset, San Francisco Chronicle, and National Geographic Traveler. Her previous books include photography for Rick Steves' Europe through the Back Door, and her commercial clients are many of the most prestigious pinot noir producers worldwide. She is an active member of the Society of American Travel Writers and American Society of Media photographers. Kerry Newberry chases stories about people through wine, food and farms. She contributes regularly to the Oregon Wine Press. Her work has also appeared in Edible Portland, NW Palate, The Oregonian, Portrait of Portland, Sommelier Journal, Tasting Panel Magazine and Willamette Week. 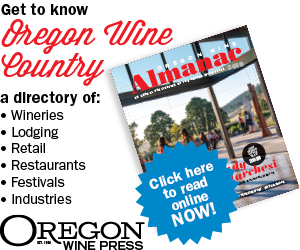 Follow Oregon's food and wine scene with her on Twitter at twitter.com/kerrynewberry. Mark Stock is a Gonzaga University alum hopelessly in love with the Pacific Northwest. He studied journalism, but like most people, makes a living off doing something completely different. A fan of Portland music, soccer, fly-fishing and percussion, Mark hopes to one day — as cliché would have it — be a published author.